This is the fifth post in our series on Real-time Data Visualization. All IT monitoring applications today place dashboards front and center of their user experience. Yet, being an industry with decades of pedigree, some of their dashboards can betray outdated approaches. However, one application that is relatively new in the space, but has still managed to set itself apart from the pack is New Relic. Their progressive approach to application performance is visible from their dashboards, most of which are real-time. 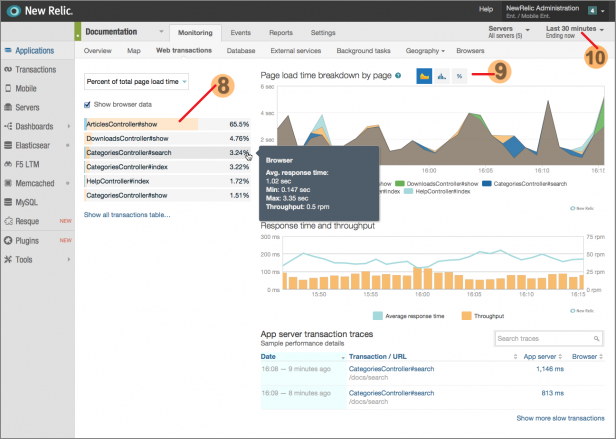 In this post, we’ll be looking at New Relic’s real-time dashboards, and learn a few lessons from their approach to solving application performance issues. The first dashboard we’ll look at is the Overview dashboard. This is the most viewed dashboard, and is the first place a user would look to get a sense of the performance of the application at any time. One glance at the Overview dashboard, and you’ll notice that it’s packed with a lot of information. A closer look shows how all this information is organized by priority. In the top-left corner of the dashboard is the ‘Browser page load time’ section, which is the most vital information for a web application. Just below that is a world map, showing the Apdex, or Application Performance Index, across different countries. Just these two sections of the dashboard are enough to gauge the situation in a few seconds. This is a feature of all successful real-time dashboards, they prioritize all the available information, and show the user the most important information first. Whether it’s their Overview dashboard, or any of the drill-down dashboards, which we’ll look at soon, New Relic sticks to this simple rule. Hovering over the main chart shows a tooltip with information about the application performance. This tooltip is used to convey the total time spent rendering. This is well thought out as it can be hard to decipher the total value from 4 different data points. However, the most interesting feature of this tooltip is that it corresponds to the tooltips in the other two smaller charts in this dashboard. Moving across the chart updates all 3 tooltips. This makes for an interactive experience, and importantly, enables deeper analysis. This brings us to our next point – context. Looking at the map, and the first chart tells the user what they need to be aware of at any given time. However, looking around at the two smaller charts, the user gets even more signals about the application performance. Given how time-sensitive the information is, and the number of factors involved, taking the time to present real-time data in context can speed up analysis, and save the user a lot of cognitive effort. This method of presenting information in context is used repeatedly and effectively across New Relic’s dashboards. While the map, and charts give the user a good understanding of what’s happening, when something’s going wrong, it’s imperative to know what action needs to be taken. A great dashboard gives not just the right signals, but also visibility into the cause or origin of the issue at hand. The Overview dashboard does this with the ‘Recent Traces’ and ‘Recent Events’ sections. These sections give the user clues on what events in the past few minutes could have triggered any issues. This way the user understands not just the ‘what,’ but the even more important ‘why.’ With just this information, the IT professional may have all they need to improve the Apdex. However, New Relic provides many levels of drill-downs in their dashboards for most scenarios which require a lot of poking and prodding around before a solution is found. Colors can easily go wrong in a dashboard when overused, or used without purpose. However, when colors correspond to the innate associations we have towards them, they can be very powerful. For example, the world map uses red, green, and yellow to show application performance. Similarly, the chart in the top-right corner shows bands of red, yellow, and green to categorize the Apdex score. Additionally, in the ‘Recent events’ section, events that are ‘Critical’ are marked with a big red dot. New Relic uses colors to draw users’ attention to critical information, and ensures it doesn’t distract the user from their objective of speeding up app performance. The drill-down dashboard, shows detailed stats on ‘Page load time.’ The bar chart in the top-left corner shows the different factors that affect page load time. Notice that this chart is sorted in descending order. This is imperative for a user to focus on the factors that need immediate attention. Also, above the chart is an option to sort by other parameters. This type of sorting is seen across the New Relic dashboards including in tables. Users crave sorting as it’s a great way to prioritize information, and take action where needed. Real-time dashboards are udpated every few seconds, and the data visible at any given time is just for a brief window of the past few minutes, or hours. New Relic’s real-time dashboards, for example, are updated every 15 to 30 seconds, and show data over the past 30 minutes. However, a user may need to go back a few hours, or maybe even a few days to spot the origin or cause of an issue. In this case, it’s important to provide a date range filter for the dashboard. Many dashboards today place this feature at the top-right corner. This feature is becoming as natural to us as a web browser’s minimize and close buttons are. The New Relic dashboard excels at how intuitive it makes the date range adjustment, with a simple click and drag option. If you’re interested in dashboard design, or if you routinely use dashboards, check out our reviews of dashboards from innovative companies like Recorded Future, Cleartrip, Toshl, Sift Science and many more. Kudos to the friendly IT/Operations guy at FusionCharts, Nishant Seth, who contributed some valuable ideas in the making of this post. 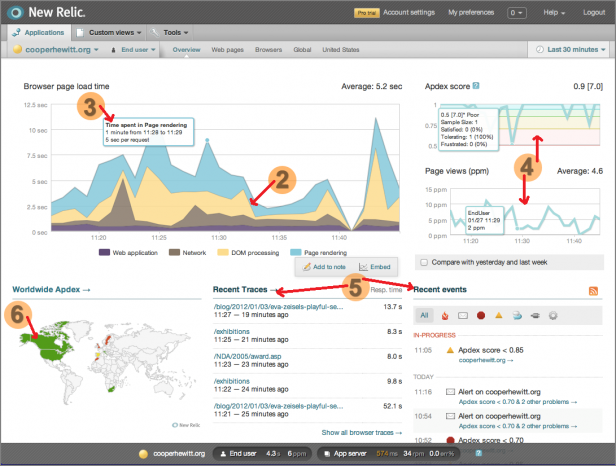 Finally, what do you think of New Relic’s dashboards? Are there any other real-time dashboards that have impressed you? Chime in with your comments below. Next post: Is the Information Dashboard set to be the next game changer for ISVs?